The tire rod end parts are not interchangeable. You need to be able to identify all the parts. This way you know what you are working with. Before you raise the vehicle, loosen up the tires a bit. As you raise the car, balance out the front and back, while chocking the rear tires. Remove the front wheels. Remove the pinch bolts. These bond the tire rods to the steering column. To remove the bolts, use a spray lubricant. Remember, the tire rod ends work with the steering column. Take off the split pins and the dust boots. Now the split pins can be thrown away. 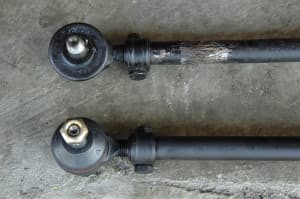 Using a clockwise motion, take off the bolts that are connected to the tie rods. Do this using the right screwdriver. As soon as you do this, remove the tire rods. After doing this, use the wheel and turn until the tires are facing the front. The next thing you will need to do is to detach the rod ends. Once this is done, get your new tire rods. Now is the time to put on the replacements. Afterwards, put back on the dust boot. Don’t forget to use the right sized wrench for each job. If you need to use grease fittings, this would be a good time to put them on. The next thing you do is your rotate the tire rods themselves into place. Use a locking ring and then put on the outer parts of the tire rod. As you install the outer tie rod to the wheel, make sure the bolt is secured in there. Make sure everything is properly aligned in the vehicle. Take a new split pin and apply it. You never use the old one. As you begin to finish up, apply some grease so that it stays securely on there. After a few moments, wipe up the excess grease and get the wheel. If you need to do the same on the other side, just repeat the process. Lower the car to the floor and have a professional alignment done. This is just to ensure that everything is okay and secure.